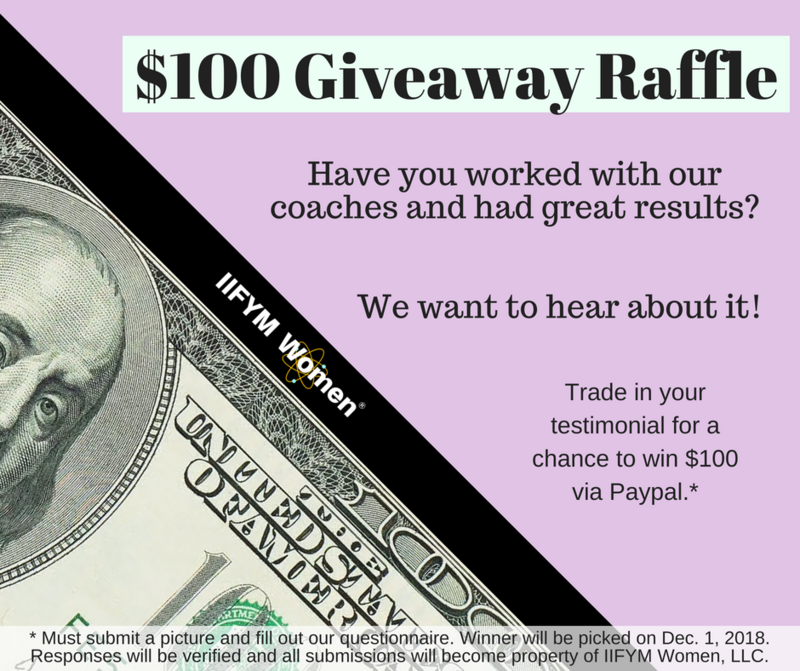 $100 Raffle Giveaway for your Testimonial! Home/Fitness/$100 Raffle Giveaway for your Testimonial! Inspire others and celebrate your accomplishments! Share the results you obtained by telling others about your experience with IIFYM Women! Hi, Goal Crusher! What is your name? What coach are you working with or did you work with? What service did you purchase? Before working with your coach, what were your struggles? What results have you achieved while working with IIFYM Women? What mental breakthrough have you achieved? What physical accomplishments have you made? What was your life like before finding IIFYM Women? What is life like now that you found IIFYM Women? Would you recommend us to a friend? Please share why? What is one piece of advice you would give someone who is unsure about IIFYM? Please note: We will use this information on social media and for marketing purposes. Thank you for your kind words. Thank you for sharing your experience.